Christmas comes early for Volca Sample owners. KORG were nice enough to open up their volca sample SDK to 3rd parties so I took a few days to rip out Caustic's WAV editor and turn it into a stand-alone, multi-platform tool that lets you import, load, record, edit and upload samples for use with your KORG Volca Sample device. It was taken from my Caustic 3.2 working branch, so it even has a few more functions than what's in Caustic 3.1! - Record your own samples using your device's built-in microphone. - Load any uncompressed, mono or stereo WAV, at any sampling rate or bit depth. - Apply any of 16 of Caustic's effects and preview them in real-time, then stamp down and apply more. - Process waveform audio with Fade In/Out, Normalize, Amplify, Reverse, etc. 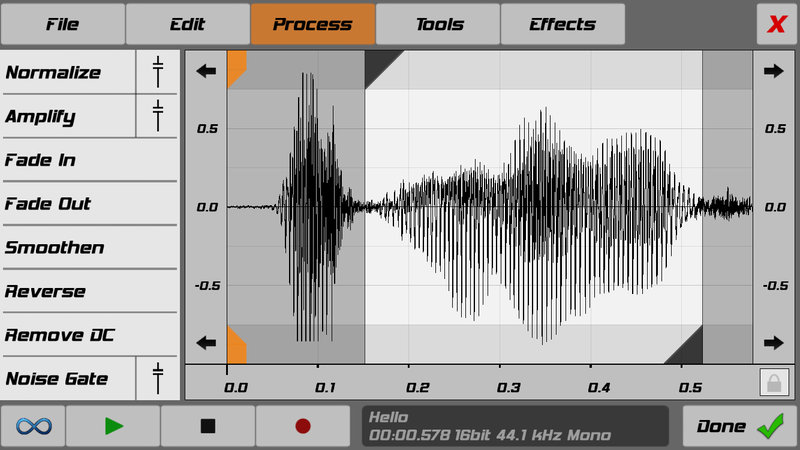 - Use Caustic's C-SFXR to generate retro video game sounds. - Trim audio precisely, down to individual samples. - View the frequency spectrum of your audio. - iOS: Open In... support for .wav files. - Upload to any of the 100 sample slots and keep a database of your device's state. This is not an official KORG app, it is made by me, Rej Poirier / SingleCellSoftware using the KORG volca sample SDK. The app is free, with no ads and no IAPs. If you'd like to support my work, please buy Caustic or any other of my apps. If you have them all... make a donation to the Red Cross. There are people out there who need the money more than I do this holiday season. Have fun sampling, merry Christmas, and happy Saturnalia. Linux: From reports of Caustic users, the Windows versions should run fine under WINE. You might need to first run "winetricks vcrun2008" to get the right DLLs. Huhhh???? My mouth won't close cause of drool. Huhhhhh??? I bought Caustic even though I don't use it. Because your work deserves to be rewarded. Wow Rej. You supported Korg's sampler on Android faster than they did and better than they could. That is just so awesome. any one have any luck with windows 8 and the cevs? im having some problems with windows 8 and the CEVS uploading samples to the volca sample..the volca sample just keeps saying cdod..lol....uggghh...any one know what im doing wrong? do you mean "dcod"? According to Korg, that's an error while decoding the stream. That usually happens if your cable isn't plugged in right and crackles during transfer or more likely that an alert sound played during the transfer. I'm not sure how to silence notification sounds on Win8 without closing all app that play sounds, but if you're transferring large samples, that could be the cause. On both my phone (in airplane mode) and my computer and with multiple cables I have yet to successfully load a sample onto the volca. About 1 second into the transfer it throws the dcod error. I've changed the volume. It feels like I'm missing some key bit of information. The wav files I'm using aren't that long (1.2 sec) and they play fine in the caustic app. I have been able to successfully delete a sample using the app though. It now skips from 89 to 91. Loading a new sample into slot 90 (or any other) has not worked. I occasionally hear little digital artifacts from the internal filter. Would this cause an issue? Could it be the batteries? Ah, good to hear. Yeah they say if you have any kind of special EQ to turn it off. I guess Dolby definitely falls into that category. I've not found the "beats audio" on my HTC One to make any difference though. I'm glad you figured it out and sorry I couldn't be more help. Is it possible to create "Sets"
Thanks for building this. I'm definitely purchasing other caustic apps to support. Now I can use my laptop for sample editing. I noticed that when you load samples then quit the samples stay. Is it possible to save a "Set" of samples then load the set? I started a few folders of sets but would have to load them into the software one sample at a time. 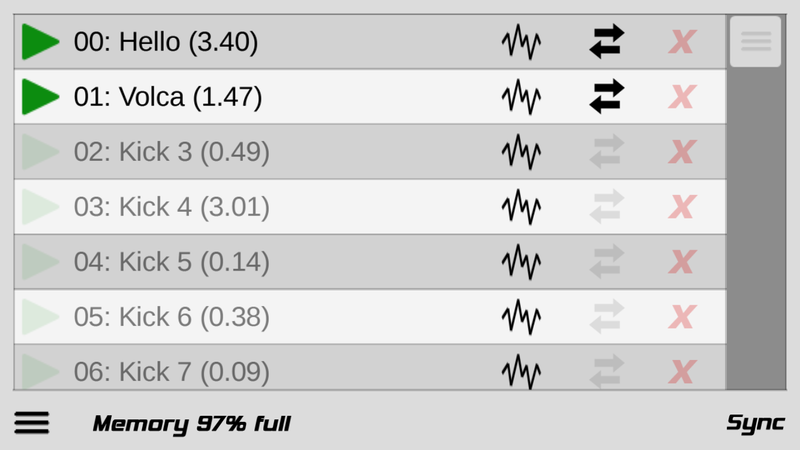 Uploaded about 25 samples to the app and memory indicated as 94% full but when I tried to sync it did the first 10 or 11 ok but then the Volca said "ERR FULL"
Any idea why this is happening? The app only has an estimation of the amount of memory used based on what it has sent and deleted to the sample. If the volca says it's full, it is. OK - thanks for the info, will have to have a bit of a rethink! 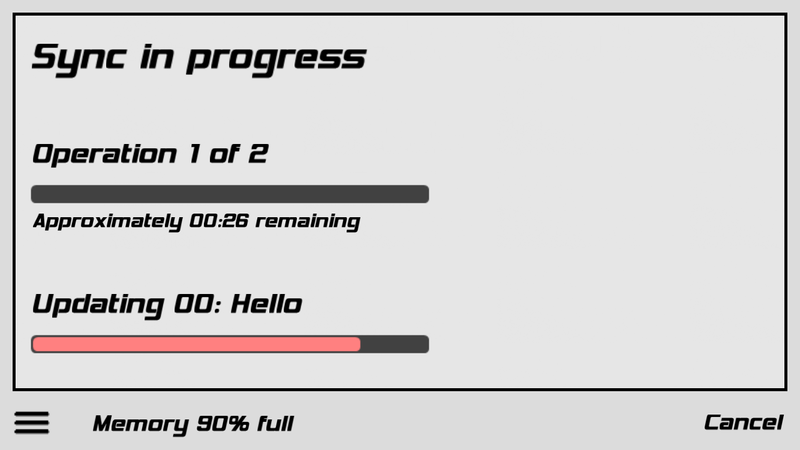 I cleared a lot more space so the app so it was showing 60% memory but it still came up as full before loading all the samples. Still haven't managed to sync more than 5 samples in the Volca at once. How do you delete a sample? Get full message when trying to upload a 4 second "hello" sample. mark it for delete (the red X), then sync. I couldn't install it on OS 10.5.8 Leopard. Any chance to make it compatible? It should be able to run on lower, down to 10.4 at least. Give me a few days though, my computer is still in a box.. I got a volca sampler this weekend but wasn't aware of the smartphone app you needed to change samples. The ventor told me about this caustic editor and I found this page. But how does it work? How does it work with a windows pc or does that not work at all? 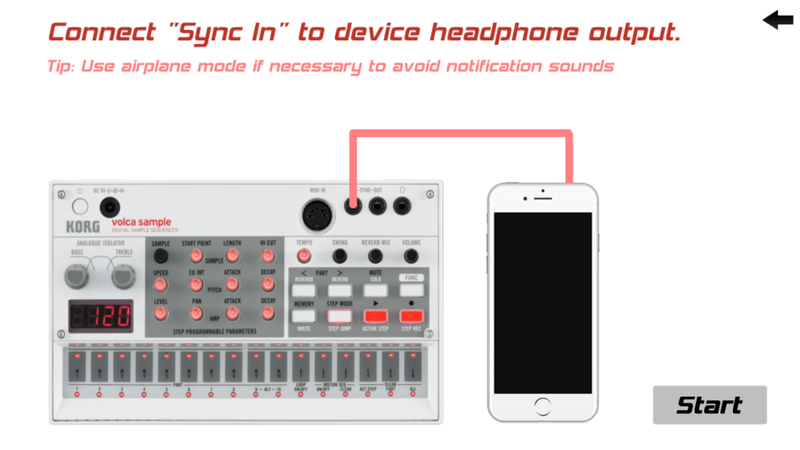 And do I connect the headphones out of my computer to the sync in of the volca? Guido: I don't actually own a Volca Sample, but AFAIK yes the app runs fine in windows (there is a windows download link on the top of this thread), and yes you are correct: the samples "play" into the Volca as audio, so you run audio out of your computer into the Sync In. As for the audio out of your computer, a headphone out is a sensible choice unless you happen to have a (usb or firewire) audio interface, in which case one of the dedicated outputs is likely to sound better. Hi, thanks for your answer! I will have a look at it. Any way to safe new "sets"? i like your software very much! Is there a way for future versions to safe full sample sets on the computer? Or send a folder with prepared samples to the Volca over your app? It is very busy to add 100 single samples. I would appreciate to have different prepared sample-set folders on my Mac (for example House, Hip-Hop, old Drummaschines, Techno, Rare Groove, Experimental etc.) and can upload the whole bunch together - or going back to the default set. Hi Joe, on a computer, it should be quite easy to accomplish this already. Just move the "samplelist.txt" file to somewhere else. Leave the WAV samples in the sample folder if you want, they won't be in the way. When the app starts and finds no sample list, it will create a factory default. Do this for each of your sets. When you want to swap sets, place the correct samplelist.txt in the app's folder, select all slots for sync (yes, this might be a bit tedious), and hit sync. Because it would be so cool to switch between different drum maschines easily - SP 1200, 808, 909, own sets etc. Great product! I am going to buy Caustic now just because of this contribution! PS: thank you so so much for making this App, i doubt i would have bought the volca Sample had i not seen your app. Hi There, I went through to Korg Support Today and after some testing realised it was a power Issue. Thank you again for releasing this App, and for free too ! Big Ups ! Hi Rej, I managed to modify some of the samples in your great app, but I can't manage to load them into my VOLCA Sample. Would you mind telling us steps to do it? I tried with my Android phone and also with my macbook. I cant seem to sync or upload to the volca. Maybe there's something I have to set in the Volca for it to work? @srge: Make sure you the volume is quite loud. You'll know it's loud enough if the volca changes its display to say "data". As for the steps, you can check out Korg's video for their app, mine has the same workflow for transferring. this missing feature is now what brought me back to Audiopocket. and itunes, aargh. korg is advertising the volca sample as the machine that brings the fun back in simple sampling, from any kind of sources. They kept their word with supproting a while bunch of formats. My app is free, and I didn't make any promises like Korg that you could sample from anything. In fact my listing only says WAV files. thanks for your answer. I understand. That is really a pity. I would pay for it if your editor and volca librarian could do MP3. Can I use your software to export the files already in memory as .wav? No, there's no way to read from the volca sample. The audio jack is input only. Hi, just got a volca Sample and obviously got your app. It's brilliant. Thanks so much for releasing it. Seems a bit greedy to ask for a feature request but is it possible to be able to save kits? up to 100 slots or however many are taken up in your kit could be saved and loaded on your iPad etc. I can see myself wanting to change the volca sample set quite often with different setups and this would make it much easier rather than changing individual samples each time. Load up a kit and then sync it. yeah, it's been asked a lot. yeah, it's been asked a lot. It gets messy but I'm considering it, after I'm done updating my other apps. If you're on desktop or Android platforms you can copy your samples folder and the samplelist file as a set and swap them out later (and force re-sync of all slots) to get a similar result. Not so easy on iOS though I know. Awesome, I didn't realise you could do that with the Android and Desktop versions, thanks I'll do that. Using iFunbox I can see the samplelist file list in the file sharing folder too, so you should be able copy the set to and from the ipad and a computer too unless I'm mistaken? Thanks so much for the cool and useful app. Relating to joezz's question above - I have managed to bulk load multiple sample to the Caustic editor app. Even the though I've deleted the original samples and the samplelist text file, the previously loaded sample names still show in the Caustic editor except they are greyed out. So we still have to select the waveform icon, file, load, select sample and then done for each sample slot. Is there a trick to formatting the samplelist text file so the new samples appear in the slots automatically? Long playing samples over song sequence. Is there anyway to set long playing samples over entire song? Let's say like recorded presidential speeches or movie clips? I noticed they will only play for so long after the inital length of the pattern then they usually stop playing in song mode. No, I think the volca limits you to 1 bar so you'd have to cut them up. but that's a question for Korg. J4t multitrack recorded and / or G stomper for the long playing samples over entire song. With G stomper the long samples have to be copied pattern to pattern and muted out so the original long pattern can play over imported caustic song, that's just one way of doing it. Until this caustic issue is fixed it looks like I will have to use J4T multitrack recorder and or G stomper to complete the task! Yeah, I think I get that now. Yeah, I think I get that now. What threw me off was that you posted your question in a post about another app, which is for interfacing with a hardware sampler...hence my response and "Korg" comment. It can't be done in Caustic right now, it'd definitely been asked a few times before and it's on the list. Thats good to know it's on the list that 3.2 is awesome though with the importing of stereo samples and being abile to add sepret fx on each and every individual sample done it for me ! Thats why when ever I make something upload it to soundcloud this devoloper always gets much props, this genus app kills all boredom! Wouldn't it be great to expand Caustic Editor for Volca Sample so you can load or save different libraries? Vosyr soft does it, but in my opinion it has poor audio quality (no offense intended).